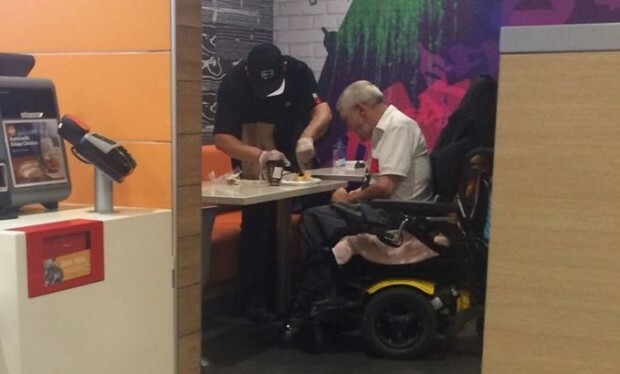 When McDonald’s employee Kenny Soriano-Garcia graciously helped a disabled man cut his food and eat at the downtown Chicago location on September 16th, he wasn’t thinking about recognition or media attention. Rather, he was simply trying to do the right thing for another person in need. But attention is certainly what Kenny’s getting after assisting 56-year-old customer, Dan Garringer, who suffers cerebral palsy, to eat his food after he approached the cashier for help. The moment was witnessed by onlooker Destiny Carreno, who captured a picture and posted it to her Facebook page, where the photo and caption have quickly gathered nearly half a million comments and shares. Destiny wrote that at that point, Kenny shut down his cash register and disappeared from view to wash and glove his hands before assisting Garringer at his table. Kenny cut the man’s food and assisted him with eating it, and then returned to his obligations at the cash register without any fuss or delay. 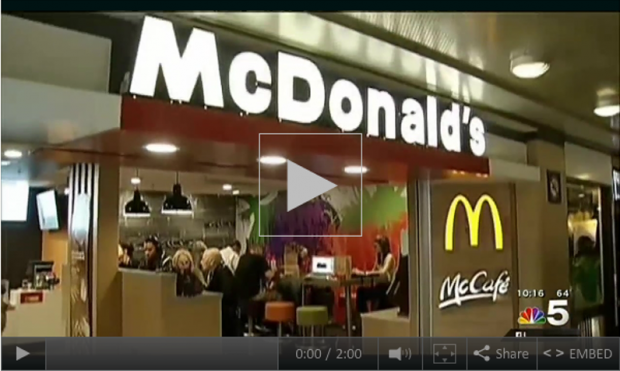 With all the business struggles and challenges that McDonald’s Corporation has faced over past several years, perhaps they have yet to adequately focus on leveraging their most valuable and compelling asset – the 420,000 people they employ worldwide. Random acts of kindness by employees like Kenny cost the company almost nothing, and yet can have a remarkably inspiring impact on customer perceptions and loyalty. 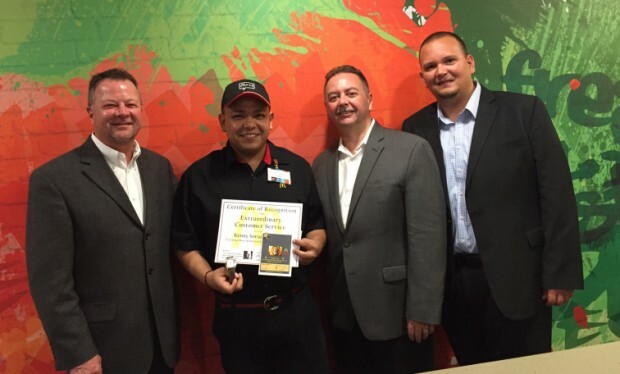 What might McDonald’s reputation and business results looks like if all its employees were encouraged my management to make a difference for customers like Kenny Soriano-Garcia did? Encourage Random Acts of Kindness: For most of human history, commerce between people was conducted face to face. Our brains and emotions remain wired for that kind of interaction today. That’s why gestures like this have such a strong impact on us. If you have employees who interact with customers, encouraging them to engaging in random acts of kindness and compassion is a worthwhile investment that can pay enormous dividends in both customer and employee loyalty. Set the Example Internally: The best way to inspire and encourage employees to engage in random acts of kindness is to do the same for them internally. They are wired with all the same perceptions and emotions as customers, so when we practice what we preach internally, it yields a similar response that makes them want to do the same for others. Taking the time to learn about the goals, passions and struggles of individual employees will make it that much easier for you to surprise them with thoughtful gestures. Don’t Keep Score: The key to making a difference in the lives of others with random acts of kindness is not keeping score or expecting anything in return. To make an impact, we must remain primarily motivated by simply doing the right thing for others and the satisfaction that brings us. Eventually others will notice and reward us generously, but only if our actions have been genuinely selfless and altruistic from the outset. A self-serving, self-promoter can be spotted from a mile away.